A greenhouse--an enclosed structure providing a special environment for plants--has been used for centuries by gardeners wishing to extend the growing season, to protect plants from cold and heat or to grow non-native plants. Once something to be had only by the rich, greenhouses are now affordable and available in a wide range of sizes. The idea of growing plants in a specially controlled environment is at least as old as the ancient Romans. Roman emperor Tiberius wished to have cucumber every day, so the plants were grown under specially constructed houses with “specularias,” or windows made from translucent sheets of mica, according to NewWorldEncyclopedia.org. In the 16th century, plant explorers were returning to Europe with exotic species from the tropics, and the Italians built the first modern greenhouses, called “giardini botanici” or botanical gardens, to support them. The practice of greenhouse construction spread to Holland and then England. These early greenhouses were cumbersome and required much work, both to close at night and to prepare for winter weather. Originally expensive status symbols of the wealthy, greenhouses began to be associated with universities as the study of botany grew throughout the 17th and 18th centuries. Referred to as “conservatories” in England, or “orangeries” and “pineries” in France (because they allowed orange and pineapple trees to be grown), greenhouses continued to increase in size and complexity. Greenhouses became more common in the 1800s, when high taxes on glass were repealed and window glass became more affordable. Among the grandest greenhouses of the era was The Royal Botanic Gardens of Kew, England, constructed under the patronage of Queen Victoria. 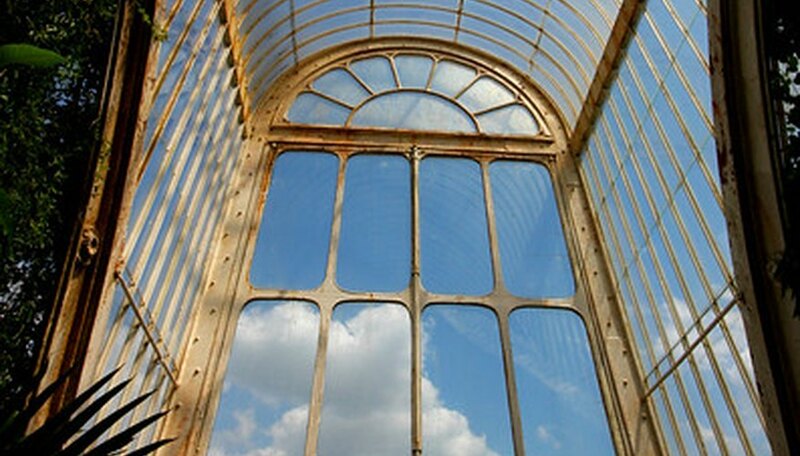 Its most recognizable structure is the Palm House, a huge pillarless span of glass and iron. The first known greenhouse in America was built by Andrew Faneuil, a well-to-do Bostonian, in 1737, according to Hobby-Greenhouse.com. George Washington erected a greenhouse at his home in Mount Vernon in which to grow pineapples. By 1825, American greenhouses became more common, and might have been heated by a furnace or simply by south-facing windows. The largest greenhouse in America today is Eurofresh Farms, located in Willcox, Arizona. It covers more than 318 acres and produces hydroponically grown tomatoes, cucumbers and bell peppers. More affordable materials and ease of construction have put greenhouses within the reach of home hobbyists. Modern greenhouses may be used to start plants early in the season for later planting outside, or for hydroponic growth of food plants. They can also serve as a source of food in nations where inhospitable climates make agriculture difficult or impossible.